Stroopwafels, treacle waffles, are a classic Dutch treat. Freshly baked they are at their best. The stroopwafel stand at the Albert Cuyp open-air market is famous. No need to go to Amsterdam because making your own stroopwafel is not difficult at all. All you need is a bit of time and a waffle iron! Stroopwafels are true comfort food; the filling is a mixture of butter treacle and brown sugar which results in a caramalised flavour. Stroopwafels are a speciality of the city of Gouda where a local baker mixed left-over bread crumbs with treacle baked it and the stroopwafel was born. Each cook or pastry cook has his or her own variety of stroopwafel. 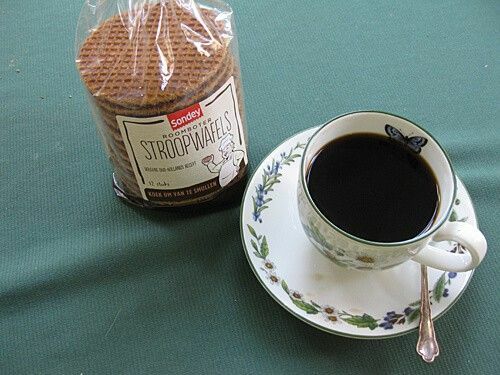 No matter what recipe you follow, stroopwafels are always delicious! Real butter is better than margarine and if you think your stroopwafel is too sweet use less sugar. 8. Put a damp cloth over the bowl and leave the mixture in a warm place. Have a look at this video to learn the tricks of the trade. Dried yeast is used in this recipe the rest of the ingredients are the same but the quantities differ. Stroopwafel, treacle waffle, is a delicious Dutch treat. These waffles with a sweet, gooey filling are best eaten when still warm. They can be bought at open-air markets but also in supermarkets. Why not bake them yourself? It is not difficult, all you need is a bit of time and a waffle iron.